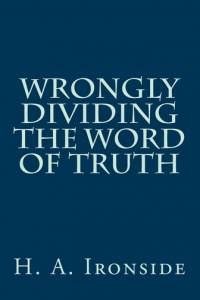 Ironside wrote this book with its unique title in 1935 (the same year he preached the funeral of Billy Sunday at the Moody Memorial Church in Chicago which he pastored from 1930 to 1948. Some have thought that the title indicates a rebuttal of dispensationalism when in fact it is a rebuttal of ultradispensationalism and a positive defense of traditional dispensationalism. I would have little doubt that Ironside borrowed the title wording from Scofield’s early work which drew attention to the subject, although it probably hindered sales of the book. Ironside himself was an early dispensational premillennialist and this small book contains many good defenses of the subject. Especially good are his explanations of Spirit baptism, and his defense of Christian baptism and the Lord’s Supper as ongoing ordinances of the local church. Who Needs The Local Church?